Long gone are the days of “It’s a boy!” cigars. Parents-to-be are surrounding the gender of their unborn baby in mystery and excitement by planning Gender Reveal Parties. 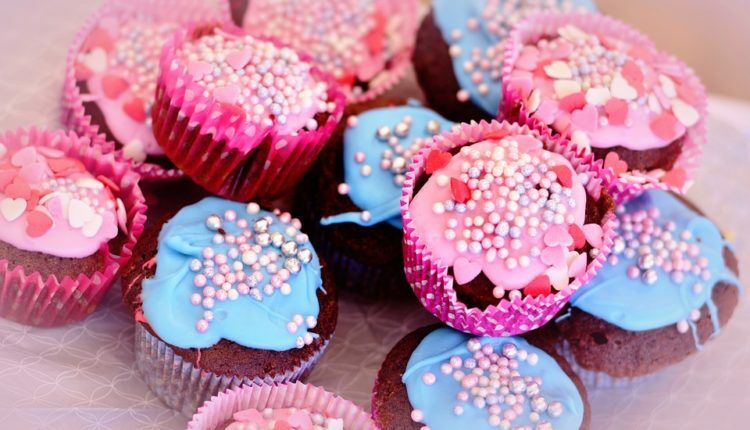 You can use a sweet treat to reveal the gender of your unborn baby to friends and family! The great thing about using a cake to reveal gender is, if you can have a nurse or doctor write the gender on a concealed piece of paper, a baker can make the cake so that even Mom and Dad-to-be are surprised! You can have the cake itself coloured pink or blue and then covered in icing or you can get creative and have the cake filled with appropriately coloured candies. Either way, the gender is revealed when the soon-to-be parents cut into the cakes. Or you can surprise guests individually by creating icing filled cupcakes, allowing them to learn the gender as they bite into the treat. If the unborn baby has any older siblings, this is the perfect way to have them involved in the reveal. You can purchase a ready-made pinata, or make your own, and fill it with confetti in the colour of your baby’s gender. To make your own pinata, simply grab a paper lantern and cut a hole from the top and bottom. Glue ribbons onto the cutout from the bottom and reattach it with tape (you’ll use these ribbons to pull open the pinata). Fill and reattach the top cutout. You can further decorate it by making fringe from streamers and gluing it onto the lantern. If a pinata seems like too much work, or a little over the top, you can always fill a balloon with confetti and let your little ones pop it! Another perfect idea for involving older siblings is to use paint and a canvas to reveal the gender. You can fill small cans with the appropriate colour and throw the paint at the canvas. To prolong the surprise, however, you can empty and clean out eggs, fill with the paint and glue the hole shut. Let your current little ones throw the eggs at the canvas – revealing the gender as they explode on the canvas. Since gender reveal parties have become such a popular trend, it’s easy to purchase items specifically for this purpose. Many companies sell powder bombs, smoke bombs and sparklers in pink and blue. Simply hand one to each guest and, after a short countdown, have them light them up or give them a toss. The gender is revealed in a flash of colour and fun! Cut out little blue ties and little pink dresses. Set up a board and allow guest to adhere their choice. Provide guests with blue note cards and pink note cards. Have them vote by writing a baby name on the color/gender they are voting for. Allow guests to choose a pink or blue necklace to wear. Paint a tree onto a large canvas and allow guests to add their fingerprint “leaf” in either pink or blue. Have them sign by their name. Create pins shaped as bows or mustaches. Have guests choose and wear one. Purchase a large frame with a wide matte. Have guests sign their name in either pink or blue.